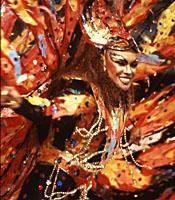 Carnival in the New World is a synthesis of European elements — Christian traditions and the masquerade — and African elements — primarily music and dance. In Trinidad, Carnival is a colorful, exuberant celebration of national focus and pride. Preparations are made throughout the year and reach a frantic pace just before Carnival begins. This informative and thoroughly enjoyable documentary goes behind the scenes to capture the spirit of the celebration and explore its major events and aspects. The video features sequences on the history and culture of steel drum and calypso music and comes with a printed glossary of Trinidad Carnival terms. “Mas Fever” is a timeless and essential work for all classes dealing with the African diaspora, cultural anthropology, Caribbean or Latin American studies, comparative religion, or ethnomusicology. It was produced by Glenn Micallef.